1. 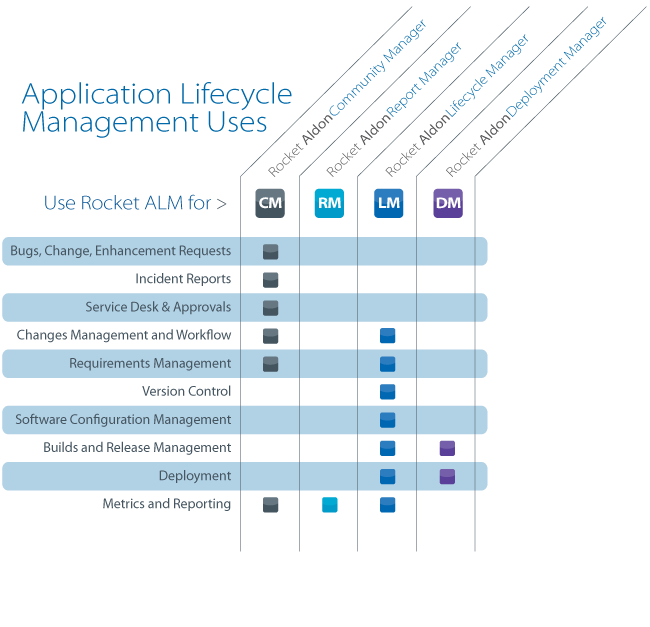 Aldon Lifecycle Management (LM) for managing the lifecycle of software development: LMi is the product for software development on IBM System-I and LMe (Lifecycle Management for Enterprise) is the product for open systems (Linux , Unix, AIX , etc.). LMe allows management of various software components associated with open systems such as PHP, JAVA, C, .NET etc. and allows distribution to open servers. 2. Aldon Distribution Manager (DM) for automated distribution to various destinations of software components managed by LMi and LMe. (The destinations can be other computers or separate folders on IBM System-I computers). 3. Aldon Community Manager (CM) for comprehensive management and documentation of failure reports, requests for changes in the software, characterization and requirements management. CM links the requirements and software characteristics to development tasks of specific software and provides all the processes that support these activities. (Authorizations, certifications, reports etc (. Aldon´s three system components can be integrated and it is possible to purchase all three or only some of them according to user needs. Installation and integration of the two parallel systems for software development lifecycle management, LMi and LMe, allow integrated management of software objects regardless of their origin. This means that software components and software development processes are managed by their logical affiliation to an application, version, or a particular task, rather than to their physical affiliation to a certain computer system or another. A certain task, for example, can contain both Cobol software components on IBM I-Series and PHP software components on Intel-based server and Windows operating system. LMe can be installed on an IBM I-Series server or on a Linux server. It is also possible to integrate the software with open source software tools such as IBM´s Eclipse, which increases the system´s efficiency. Aldon LMe for open systems also enables integration with open systems for version management such as Subversion (SVN) on open systems such as Windows, Unix and Linux. In this integrated configuration developers use open systems for actions such as the Checkout and promotion (also known as check -in), and the Aldon system is used for managing the software components (repository) and for a reliable distribution of the software components to various destinations (testing, integration and production). Installing Aldon in such a configuration to open systems is cost effective, but is more limited and does not allow taking advantage of many of Aldon´s unique and advanced features. The licensing model for Aldon LMe is based on several users. There is a one-time cost for the core system. In this licensing model Aldon´s open tools are available to every user (for example Harmonizer that allows merging multiple versions of the same program). 1 . Named license or named seat – a named license is the basic license that allows a single user to use the system. It is designed for one specific user. It is possible to transfer the license from one user to another but it requires an intervention of the administrator. Such license is given permanently to a single system user, for example, a software developer. 2 . Concurrent license or floating seat – a floating license is granted for use to several users as long as they don´t use the system simultaneously. The system enforces the number of concurrent users and makes sure their number would be less than or equal to the number of concurrent licenses, but the users themselves can be replaced. The system configuration process determines the identity of users that receive these licenses. Such licenses are assigned to occasional users such as managers, auditors, information security managers and others. KDE Group recommends each concurrent license will be issued to no more than 5-7 users.